Faraday Future has begun expanding the factory it leased last year in Hanford, California. The equipment required for the production of EVs has already been ordered, and is scheduled to be installed at the end of May. After Faraday Future halted plans to construct a billion dollar factory for EVs in North Las Vegas, the company leased the Hanford factory. The factory only has about 700,000 to 800,000 square metres of space available however. After a row of negative headlines in the past months, Faraday has some good news again: Faraday Future has secured a financial injection of 1.5 billion dollars from a Hong Kong investor. A third of it is reportedly already in the FF accounts. 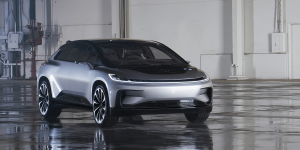 Furthermore, Faraday reaffirmed its plans to deliver the electric SUV FF 91 this year at a meeting with suppliers.